A range of space weather phenomena can affect both aircrew and aviation technical infrastructure. The health of aircrew can be affected due to elevated radiation exposure mainly caused by Galactic Cosmic Rays (GCR) and by occasional solar eruptions of energetic charged particles (Solar Energetic Particles - SEP). Technical infrastructure can suffer from degradation or loss of communication and navigation signals, as well as avionics errors. Such disruptions can be caused by both electromagnetic and charged particle radiation, as well as changes in the ionospheric conditions. The service "Non-Space Systems Operations – Service to airlines" aims at provision of access to global information, data, models and tools addressing these issues to help pilots and airline dispatchers in flight planning, especially for flights affected by space weather effects. the Space Weather Data Browsing and Analysis (SWE Data) provides access to space weather environment data. This service page is curated by the ESC Space Radiation. For further information, please contact SSCC Help-desk. The radiation environment at aviation altitudes is shaped mainly by Galactic Cosmic Radiation (GCR) that comes from outside of our solar system, is modulated by solar wind, and interacts with Earth's magnetosphere and atmosphere. As an effect, radiation exposure at aviation altitudes is slightly higher than that at ground level. Additionally, some solar events may lead to additional enhancements of radiation exposure not only in atmosphere but also even on the ground – so-called Ground Level Enhancements (GLEs). The elevated radiation at flight altitudes during a GLE, although temporal, can be notable especially for high latitude flights. The user who is interested in the increased radiation levels during flights can use the Aviation Dosimetry (AVIDOS) tools, accessible from the Tools tab. AVIDOS is an informational and educational online software for the assessment of cosmic radiation exposure at flight altitudes during quiet and extraordinary solar conditions. It estimates route doses for flights between any two locations and calculates now-cast exposure during solar storms. It also provides a comparison of assessed exposure with natural background radiation on Earth. AVIDOS has four modes: "public", "aircrew", "waypoint" and "science". Public mode is designed for a user that demands quick assessment of cosmic radiation exposure for a selected flight without considering all technicalities. For calculations in public mode one needs to enter only date and time of the flight, departure and destination. In aircrew mode, the user can easily appreciate influence of flight route, altitude, duration and even flight date on the assessed radiation exposure by having the possibility to change all those parameters. Waypoints mode allows for dose assessment of a waypoint-by-waypoint designed flight including a complete set of parameters for each waypoint. Waypoints can be uploaded as batch file including: flight and waypoint identifications, altitude, date and time, and geographical latitude and longitude. Results can be downloaded for personal use. With science mode, researchers and experts can analyse dose dependency for different solar proton spectra or investigate different flight routes for the same extraordinary solar condition. Science mode offers: several implemented solar proton spectra, several implemented representative flights, all aspects of the spectra and flights are editable, results are displayed in terms of effective dose, and ambient dose equivalent and can be downloaded for personal use. The RadSEP product provides a post-event analysis of the impact on the radiation environment at aviation altitudes due to solar energetic particle events during GLEs in addition to the contribution from galactic cosmic rays. The dose rates are calculated for a number of predefined flights with various departure times with respect to the GLE onset time. The product can be accessed under the Aircraft Effects and Radiation Exposure: Data Archives section of the Products tab. To protect aircrews' health, European legislation and various aviation authorities impose requirements concerning assessment and limitation of radiation exposure, as well as provision of information on cosmic radiation (see Auxiliary Info). Space weather also affects airborne technical infrastructure especially for high latitude flights. Solar phenomena emit electromagnetic radiation and energetic particles that can ionise lower layers of the ionosphere (so-called Polar Cap Absorption - PCA). Disturbed ionospheric conditions influence very high frequency (VHF) signals of Global Navigation Satellite System (GNSS) often used for aircraft navigation and high frequency (HF) radio communication. Due to effects like attenuation, phase shifts, unexpected reflections, interferences and scintillations it may come to a disruption and even loss of navigation and communication signals (Radio Blackouts). Furthermore, aviation electronics and systems are exposed to atmospheric neutrons and protons created by cosmic rays interacting with atmospheric nuclei. This may lead to so-called Single Event Effects (SEE), mostly to a Single Event Upset (SEU) – non-destructive, soft error in electronics. 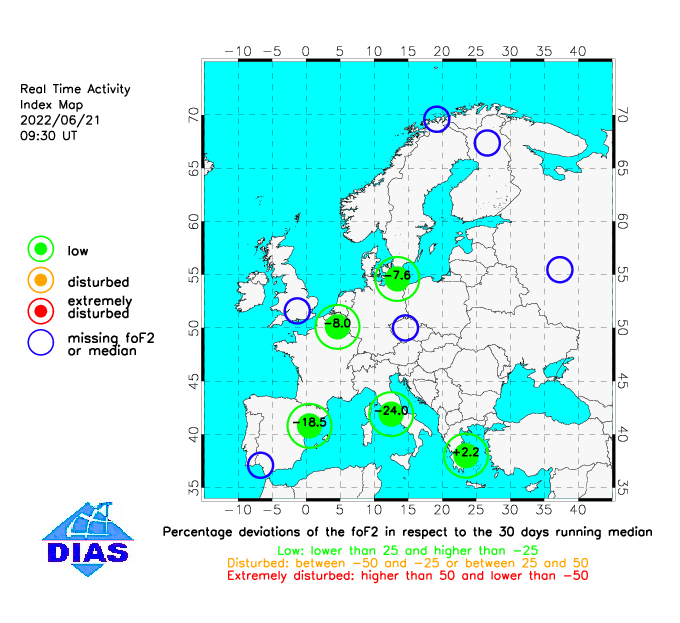 Information on the current and forecasted ionospheric conditions is provided through several monitoring centres and facilities, like the Ionosphere Monitoring and Prediction Center (IMPC), the Real-Time Ionosphere Monitor (RTIM), the European Ionosonde Service (EIS), the Ionosphere Monitoring Facility (IONMON) and the Service Supporting Resource Exploitation System Operators (RESOSS). The specific products provided can be accessed through in the Ionospheric, Thermospheric and Atmospheric Conditions section under the Products tab. For further information, please contact SSCC Help-desk. AVIDOS 2.0 is an online, informational and educational software for the assessment of cosmic radiation exposure at flight altitudes. AVIDOS 2.0 performs assessment of cosmic radiation due to galactic cosmic radiation and attempts to nowcast radiation exposure due to solar energetic particles. AVIDOS 2.0 uses real-time data from Oulu neutron monitor station and real-time alerts from GLE-alerting service ANeMoS. The Athens Neutron Monitor Station (ANeMoS) provides access to the following tools. GLE ALert plus provides alerts for ground level enhancement (GLE) events and produces every minute a General GLE Alert Graph and station alert graphs for all the stations participating in the network; The multi-station Neutron Monitor data provides continuous measurements of galactic cosmic rays from neutron monitors located around the world. Directive 2013/59/Euratom Basic safety standards for protection against the dangers arising from exposure to ionising radiation. EC Radiation Protection Publication 140 Cosmic Radiation Exposure of Aircraft Crew: Compilation of Measured and Calculated Data. EC Radiation Protection Publication 156 Evaluation of the implementation of radiation protection measures for aircrew. ICRU Report 84 Reference Data for the Validation of Doses from Cosmic-Radiation Exposure of Aircraft Crew.